Now, here's an unexpected treat for Pixar fans. Not long ago we got our first look at the studio's upcoming Coco via the first teaser trailer. We were expecting it would be at least a couple of months before we got another chance to visit the film's world. It's proved not to be the case and a new video has been released already. It's not another trailer though.. it's something altogether better. In fact, it's a brand new short film set in the world of the movie. Dante's Lunch was produced early in production, to allow the team to get one of the film's key characters better. 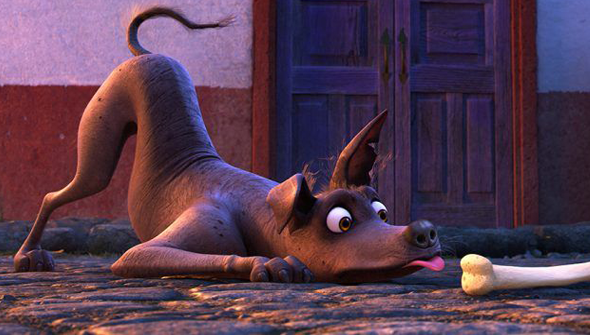 That character being Dante, the canine companion of Coco's lead, Miguel. We got our first look at him back in the trailer, but here the lovable mutt takes centre stage. It's cute, funny and full of character, and gives us a better feel for Miguel's hometown than the teaser allowed. Coco will hit cinemas in the US on November 23 and in the UK December 1. Check out the short below (via Yahoo Movies).